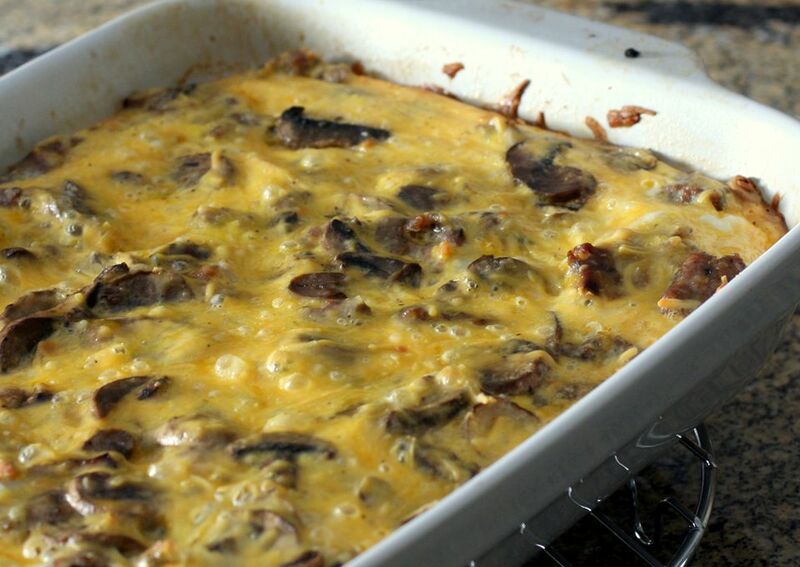 When you want to serve breakfast or brunch for a gathering, this easy breakfast casserole recipe is a go-to choice. The classic flavors of sausage, eggs, cheese, and potatoes blend together for a real crowd-pleaser. This casserole can be the centerpiece of a lovely spread including fresh fruit, fruit juice, yogurt, and breakfast pastries. You can use your favorite kind of frozen prepared hash browns for convenience. Or, if you have whole potatoes available, you can shred them to use. You can even use them without peeling as long as you give them a good scrub. Tater tots also would work in this casserole. Pork sausage is a suggestion, with your choice of spicy or mild. You could use any type of sausage that can be crumbled and fried. Link sausage could be used if you slice or chop it finely. Chopped ham or crumbled bacon are other good substitutes. This tasty and easy breakfast casserole can be made ahead of time and refrigerated overnight (or up to three days) before baking. Then simply take it out of the refrigerator about 15 to 20 minutes before baking for a no-fuss morning. Heat the oven to 350 F (180 C/Gas 4). Butter an 8-inch square baking dish. In a large skillet, cook sausage and onion, breaking up sausage with a spatula. When sausage is cooked through, drain off excess fat. In the prepared baking dish, layer the hash brown potatoes, half of the shredded cheese, browned sausage and onion mixture, then the remaining shredded cheese. In a bowl, whisk together the eggs, milk, and pepper; pour the egg mixture over cheese. Cover the baking dish with foil and bake for 45 to 55 minutes, or until a knife inserted near center comes out clean. Transfer the casserole to a wire rack and let stand for 10 to 15 minutes. Cover and refrigerate any leftovers. They are easy to microwave to enjoy for breakfast the next day. Another idea is to wrap a slice in a tortilla and add salsa for a breakfast burrito. Eat the leftovers within two days or freeze them. Frozen servings reheat easily in the microwave. This recipe keeps it simple, but you can get creative and add more vegetables to the mix. Chopped steamed asparagus or broccoli florets are good ideas. You could take it in a Tex-Mex direction by adding a 4-ounce can of mild chopped green chile peppers or 1/2 cup of finely chopped bell pepper, plus a couple of teaspoons of chili powder or taco seasoning.